We found this blended whisky on our recent trip to Spain and having never heard of it, thought that we would give it a try. DYC is the abbreviated company name of Destilerias y Crianza del whisky, which opened Spain's first whisky distillery in 1959. The distillery is located in the town of Palazuelos de Eresma in the Castilla y Leon region to the north west of Madrid and has the capacity to produce a massive 20 million litres of spirit per year. 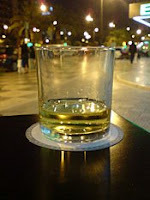 The whisky is marketed to be low budget and is popular in Spain as it is much cheaper than Scottish, Irish or American whiskies. It is designed to be mixed with non alcoholic beverages and be easy drinking in the hot weather. A one litre bottle will cost you between 10-12 euros (about £8-10). 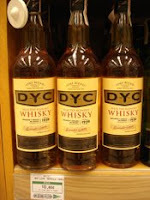 This regular DYC release is a blend of malt and grain whiskies that have been matured in crianza red wine casks. So we had to try it! I got a strange look from the bar woman when we ordered it straight and she almost insisted that we had some cola with it. She then proceeded to pour me the rest of the bottle which must have been the equivalent to a quadruple shot (or a quintuple, if that's a real word) and this left me wondering what we had let ourselves in for and how popular this stuff really was? How long had she had that bottle sitting there? Had she won a prize from her boss for finishing the bottle off? This cost me only 7 euros! The colour is a very pale gold and the nose is very light with almost nothing there. There is a bit of vanilla and caramel with a whiff of alcohol and petrol (never a good sign, but then we were sitting outside next to a main road!). On the palate, it is again very light with the vanilla notes prominent and also something herbal (think of fresh cut grass) coming through. The finish is short, very sharp and almost acidic. We were both pleasantly surprised that it was actually quite nice! It doesn't have the complexity of other whiskies that we have tried but was thirst quenching and we could see how it was popular in a hot climate, maybe with ice or a mixer. This is a simple blended whisky with minimal character (we thought there would be more influence from the crianza wine casks, as this is a full bodied red wine that should add more fruitiness) but one that is easy drinking, refreshing and dirt cheap. If you are ever in Spain, it is worth a try. Sorry for the lack of posts during the last couple of weeks, but we are currently catching some sun in Spain and Portugal. Regular posting will start again on our return, with news of a few thing we have tried during our holiday. 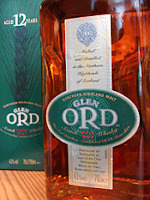 Glen Ord was the first distillery that we ever visited. We can definitely recommend the tour there as you get to walk around the working distillery and was very informative. Also, you get to taste the goods at the end, which makes it even more worth while! It is based to the north of inverness in a small town called Muir of Ord (not the best place to be stuck for any length of time, trust us...!). The surrounding area is referred to as the Black Isle. This is one of the most fertile areas of farm land in Scotland and as a result is reknowned for growing some of the best barley. Glen Ord is owned by drinks giant Diageo and is their fourth largest distillery in Scotland, producing over 3 million litres of whisky per year. Despite this, the only current official release from the distillery is this 12 years old. Most of the whisky produced at Glen Ord is used in the blending of the Johnnie Walker range, which is a massive global brand. The nose has some sweetness and maltiness (imagine the smell of a sweet style of bread, like a brioche) with some dried fruit (raisins and sultanas). On the palate, it is the malty flavour that is prominent and this combines with more dried fruit sweetness to give a lovely creamy feeling in your mouth. There is also hints of citrus and nuts (think of lemon zest and almonds) and something spicy right at the end (ginger or cinammon, I couldn't quite decide). The finish is reasonably short but is creamy, malty and soothing with that spicy note coming through again. we purchased our bottle at the distillery but it can be found in most independent retailers for around £30. Some people find Glen Ord a bit too malty with lots of barley influence but we really like it. 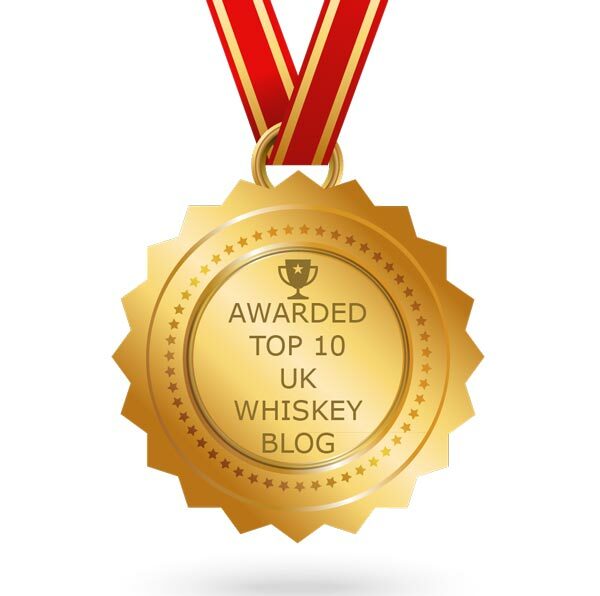 This is maybe because we have a soft spot for the distillery and the memories of the visit. It is a very pleasant whisky that is not the most complex but very good and enjoyable. 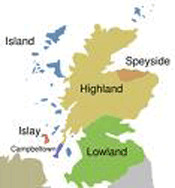 There are six major regions of whisky production in Scotland and each region has it's own general characteristics. Of course, there are exceptions to every rule but here I will explain these basic regional characteristics and this may help you to select which style of whisky will suit your taste. Within each region, each distillery also has it's own individual characteristics and this diversity gives us the different styles of the same drink and is what makes the world of whisky so interesting. There are currently over 80 distilleries in operation throughout Scotland. The Lowlands was once a major area of production but fell on hard times in the 1980s and early 1990s. Currently there are only three operating distilleries - Glenkinchie, Auchentoshan and Bladnoch (which was closed in 1993 and reopened in 2000). 'The Highland line' runs to the north of Glasgow and Edinburgh and this imaginary line is the boundary between the Lowlands and the Highlands whisky regions. The style of whisky produced in the Lowlands is light, fresh and fruity and are regarded as very easy to drink. They are subtle and refreshing, good for hot weather and as an introduction to whisky for someone who has not tasted it before. The Highlands is the largest region and contains some of Scotland's remotest distilleries. The distilleries are spread far and wide and include Glengoyne that is very close to 'the Highland line', Oban on the west coast, Dalwhinnie in the middle of the Grampians and Old Pulteney up in the far north. There is a large diversity of styles due to the geographical locations but generally the whiskies produced are richer, sweeter and more full bodied than from anywhere else in Scotland. Distilleries that are located by the coast can also have a salty element to their whiskies, due to the casks breathing in the sea air during maturation. Campbeltown is found on a peninsula on the west Highland coast. It was once home to 15 distilleries but the industry there fell on hard times, partly due to the remoteness of it's location and the resulting problems in transportation. 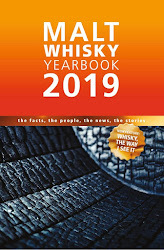 Now there are currently only three operating distilleries in Campbeltown - Springbank, Glen Scotia and Glengyle (which has only just reopened in 2004, having been closed way back in 1925). They all use peated malt and the resulting whiskies have a light smoky flavour mixed with some maltiness and sweetness. They would be good examples to give to someone who was wanting to try a smoky whisky but not something too heavy or overpowering. The island of Islay is the traditional home of smoky whiskies. Six of the eight operating distilleries produce the best smoky whiskies in the world and include some very famous names (the six are Ardbeg, Bowmore, Caol Ila, Kilchoman, Lagavulin and Laphroaig). The other two are Bruichladdich and Bunnahabhain, whose whiskies are normally unpeated and non smoky, but they do both occassionally produce limited edition smoky ones. 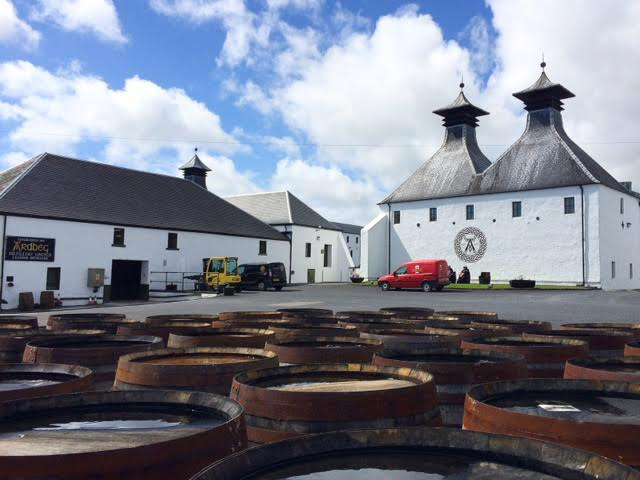 The Islay whisky industry is booming and production on the island is at an all time high to meet demand. 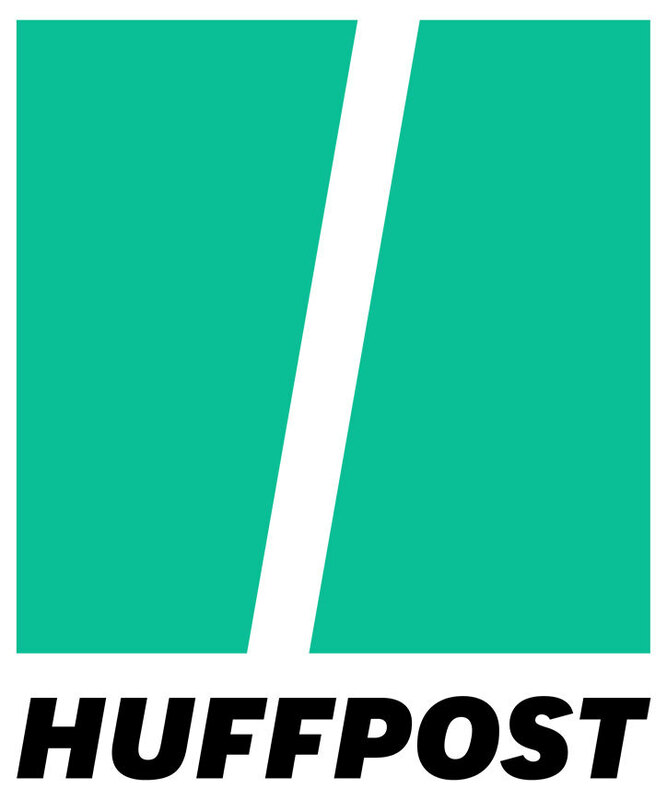 The industry runs the island's economy by giving jobs not just in manufacturing but in other areas, such as tourism. 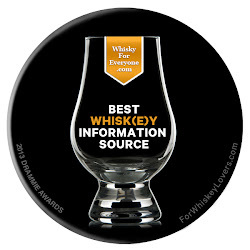 The whiskies are full bodied, smoky and complex. However, they are not to everyone's taste as they are so full on but are definitely worth a try. How will you know if you like it (or don't like it) if you don't try some? Springbank is pretty unique amongst Scottish distilleries, as it has been continuously owned by the same family since it opened in 1828. The distilley is located on the Campbeltown peninsula, which is on the west Highland coast. Springbank is small (their maximum production capacity is only 750,000 litres per year) but their whiskies are highly regarded within the whisky world. They are also unique in the fact that they produce three different whiskies at the distillery. The first is Springbank which is lightly peated (around 15ppm) and is distilled two and a half times (this means that the spirit is distilled twice but some of it is allowed to drain back in to the still and is therefore distilled for a third time). The second is Longrow which is heavily peated (about 55ppm) and this is distilled twice. The third is Hazelburn and this is completely unpeated and distilled three times. The production is split between the three throughout the year with 80% of the time going to Springbank, 10% to Longrow and 10% to Hazelburn. 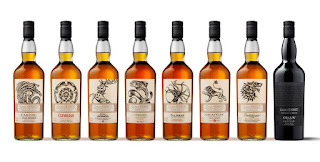 There are currently five regular bottlings of Springbank, three of Longrow and one of Hazelburn, although limited releases are added to these from time to time. 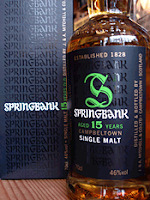 This Springbank 15 years old forms part of the core range and the nose smells good. There is a clear sherry cask influence with dried fruit (raisins and peel) and nuts (almonds, I think). It reminded me of Christmas cake! Then comes a whiff of woody bonfire smoke. On the palate this feels creamy and very pleasant. That fruitiness is there and it is complimented by the smokiness lingering in the background. There are some other very interesting elements present, with hints of vanilla, coconut, something spicy (imagine black peppercorns) and something tangy and salty. The finish is long with the smoke and vanilla prominent, although it did get very dry, woody and bitter right near the end. This is a very good whisky and would be a great one to introduce someone to the smoky flavours that whiskies can have, as the smokiness is not too prominent but compliments the other flavours very well. A bottle will cost you anywhere between £40-45.